It’s not often you’ll see Kagetsu open the show, and you got the impression she didn’t view Hanan as a threat. After shrugging off an initial flurry, she started bullying the youngster, dragging her around the ring by her hair and spitting water in her face. That casual attitude almost came back to bite her, though. Hanan fired-up and ended up locking in an Armbar which Kagetsu struggled to escape. Of course, Hanan was never going to win, and Kagetsu eventually gave her a taste of her own medicine, trapping her in an Armbar for a quick submission. However, this was a decent example of the established star working with a rookie trope. Kagetsu gave Hanan enough to make her look good while at the same time not damaging her own aura. It wasn’t a great match, but it was fun. Onozaki continues to be her teammates’ worst enemy. Today’s mishap came when she punched Starlight Kid who was stood up with Yoneyama’s legs trapped in an Indian Deathlock. Of course, that caused her to fall back, doing more damage to the smiley old lady. Poor Leo will learn eventually. Outside of that, this was what you’d expect. A fun, but throwaway three-way-tag that saw Kid and Brookside continue their hot streak. It’s short enough that you might as well watch it. AZM was incredibly harsh and referred to JAN as the ‘fat ones’ before the match. The idea that anyone in JAN is fat is laughable, but we can perhaps avoid the body shaming in the future. Be smarter. That unpleasantness aside, this was a lot of fun. It’s one of those mid-card Stardom tags that I don’t have a lot to say about but enjoyed from start to finish. It was wrestled at a fast pace by five talented wrestlers and a rookie with a load of potential. One of the highlights ended up being that rookie, Iida, battling it out with Utami in the final minutes before falling victim to the Torture Rack. It’s not a match I’ll ever return to, or perhaps even think about again. However, for the time it was on my screen, it did the job. Occasionally that’s all you need. This match featured the baffling moment where Viper responded to Natsu doing her Bronco Buster on Momo by splashing her into the corner mid-move. Going to put it out there, I suspect that will have caused a lot more damage to Watanabe than the move was by itself. Anyway, alongside having Sumire’s crotch smashed into her face, Momo is building to her match with Miyagi. They got the chance to play and looked pretty good in the process. I know I’ve been watching her for a while, but Miyagi’s speed still catches me off-guard. She doesn’t look like she should be able to move around the ring the way she does while Watanabe is Watanabe. We can rely on her. The finish saw Viper tag in at the same time as Sumire and get down to one of her favourite past times, beating-up Natsu. Although Sumire did get a visual pinfall off a roll-up after a Yamaguchi assist, it wasn’t to be. Bea and Viper combined to hit a move that will be very familiar to CCK fans before a Michinoku Driver from Viper got the three. Decent stuff. You can’t fault Rebel Kel’s confidence. She had decided she was entitled to this title shot after only three matches in Stardom. I was going to question that logic, but apparently, I would be wrong. STARS contemplated a sneak attack to kick things off after Hana’s gang refused their handshake but were put off by the size of Kimura’s new buddies. Not long later Tam was being kicked down the venue stairs while Hana had a good old laugh at her expense. The size of Goya Kong would prove to be pivotal to this one. STARS’ initial attacks were bouncing off her, as nothing they did seemed to make a dent. We even saw Iwatani fail to hit a German when she realised she couldn’t get her arms around Kong to do so. To win the match, they were going have to take her out. And to take her out, they had to work together. A Triple Superkick turned the tide before Tam and Kashima leapt onto their super heavyweight opponent, pinning her to the ground. That left Iwatani to roll-up Rebel and escape with the win. She might have been worthy of the title shot, but she couldn’t win it. Afterwards, Kong jumped on the mic to call out Kagetsu and declare she was taking her belt to Mexico. Kagetsu responded by telling Goya she’s going to slam her. That was followed up by Mayu and Natsuko facing off and talking about the winner of their match heading to MSG. This was a fun outing that had Hana’s gang look strong in defeat. Nothing incredible, but worth a bit of your time. 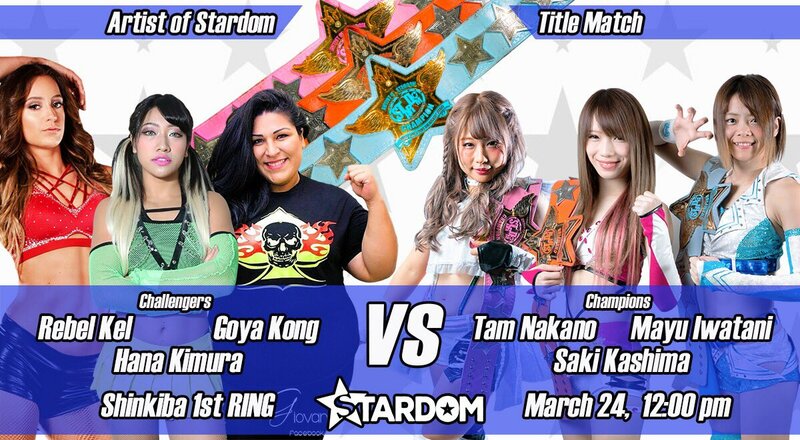 A solid showing from Stardom that won’t blow your mind, but delivered across the board. They’re going into Korakuen looking good and while that show has already happened, I’ve managed to remain spoiler free, so I’m looking forward to catching up!